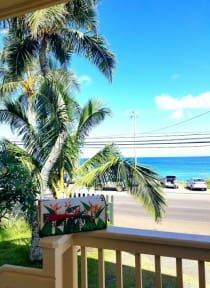 Our hostel/vacation rental is located in the center of the seven-mile miracle of the North Shore of Oahu. We\'re directly across from the Pupukea Marine Preserve a.k.a \'Sharks Cove\' which is excellent for snorkeling and diving in the summer months. The Rental is walking distance to a full grocery store, lunch wagons, surf shop, bike shop and Pipeline/Waimea bay/Sunset beaches. We have private rooms with Double and Single bunk beds. All rooms have access to a fully equipped kitchen, living room area and bath which are shared by other guests. For those on a budget, we also offer male and female dormitory style rooms with bunk beds to share with other guests. We have free parking and snorkel gear on site. Bikes are also available for hire. * Please contact us when you make a reservation if you have preference to a certain room. 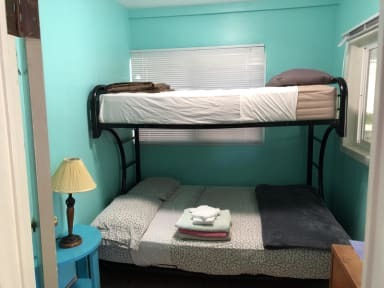 We have double on the bottom and single on the top bunk bed rooms and we have single on the bottom and single on the top bunk bed rooms. If you do not contact us you will be given whatever room is available and it may not suit your preferences. We offer airport pick-ups and drop-offs, please contact us for details. **There's a friendly fluffy kitty named sunshine that lives on the property.